The Neuros MPEG4 Recorder is essential for any PSP owner. Retailing for £149.99, it allows you to convert any video source (TV, Camcorder, DVD Player, Satellite) to MPEG4 format onto your Memory Stick Pro Duo card or Compact Flash Memory Card. 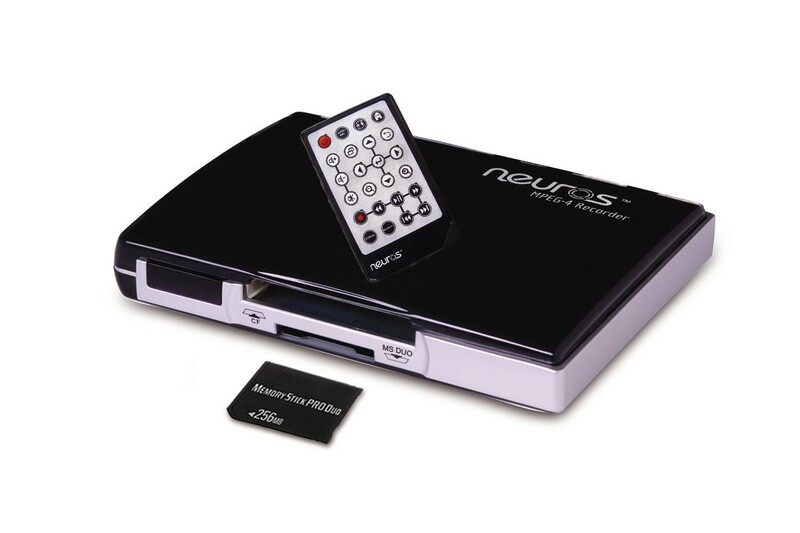 Simply remove the Memory Stick from the Neuros MPEG4 Recorder and pop it into your PSP for instant playback, without the use of a PC! Measuring just 11.7 x 8.6 x 1.7cm and weighing 140g, it is ultra lightweight and compact. Once installed and linked to a video source, you can leave it in place just like a VCR. User Manual Driver and Bundle Software Pack. Using the Neuros Video Recorder, gamers will also have the opportunity to record their best game sequences from their console games. All they need is the Recorder and a RCA composite to miniplug adapter. Game enthusiasts will no longer have to try to explain their latest moves or achievements, as the video they record will do it for them. How do i get it here in america? You can buy it over at Amazon.com and major electronic retailers. Anyone else notice that the PSP upgrade 2.7 prevents anyone from viewing movies recorded using this device? If you upgrade, you just bought a paperweight! Actually, they will be releasing a firmware update for the device soon!